This story starts many many years ago when my friend Mike and I were hunting pig in Makaha. We had dropped into the valley after climbing to the top of Kamaileunu Ridge (low back) on the Kumaipo Trail from Wai`anae Valley. We were walking mauka on a beautiful wide trail on the right bank of a flowing stream. Soon we noticed on the other side of the stream a dark tunnel entrance and water flowing from it. For some reason we turned around and did not investigate. Perhaps the dogs began chasing a pig and that took us away from the tunnel. Years later while beginning to hike in Makaha w/Dan I mentioned the tunnel and we began a search. Twice we entered the valley and using approx GPS readings from the USGS map we tried and tried but could not locate it. Earlier this year while on his own Dan finally located the tunnel entrance but did not attempt to enter it. Today we would do just that. Our group consisted of three wonderful women, Emi, Stanka, and Mary. Then the male contingent was Dan, Gene and myself. A little more tunnel history before we begin. According to H. T. Sterns in his book "Geology and Ground Water Resources of Oahu" written back in 1935: "Tunnel 10 was evidently a wildcat tunnel, because it is so dry and so long and the report that this tunnel was started to drain the swamp on Kaala Mountain seems credible. ~~~Tunnel 10 is about half a mile from the head of Makaha Valley, at an altitude of about 2100 feet. It is driven about 1,400 feet through Waianae basalt. ............ The tunnel starts facing 72 degrees north, but soon turns and ends heading 20 degrees north. The tunnel was yielding only a gallon a minute on January 19, 1932. It is reported to be dry except during heavy rains. " Taking the above into concideration is my memory of water flowing out of the tunnel accurate??????????????????? It was 30+ years ago. 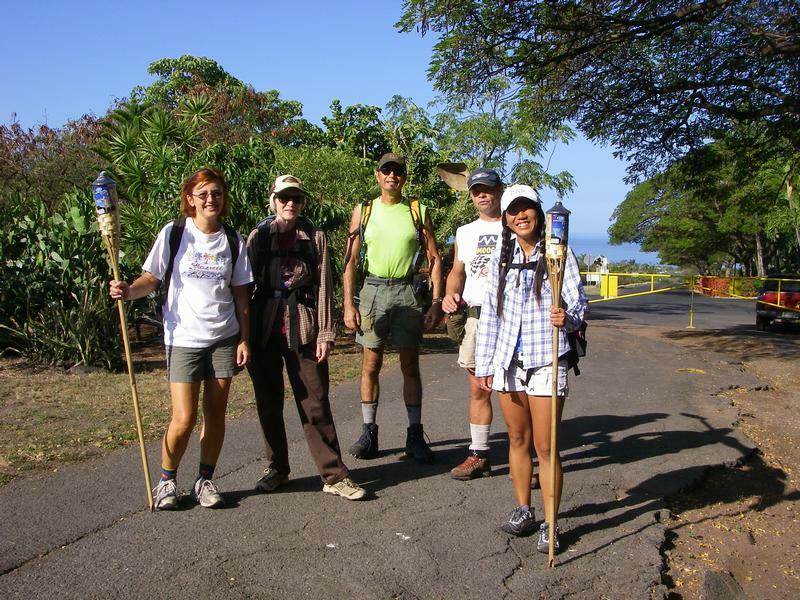 Anyway we gathered at the Makaha Towers and begain our hike around 0830. Here is a photo that Dan took of the rest of the group. The tiki torches would be left at a secret location and later taken up to the "camp" at Banana Falls by Gene. Emi is from Japan and very much interested in everything she sees. 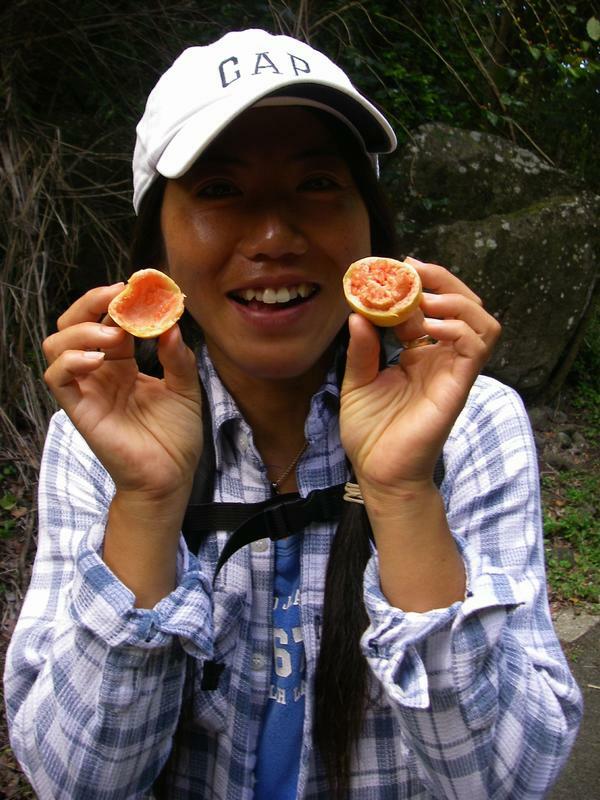 I think this may have been her first guava.